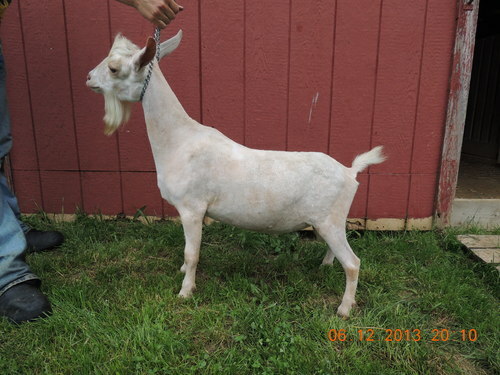 Photo of Xena, courtsey of Irish Whisper..
Berry has always been my favorite and she has not disappointed me. Her subsequent freshenings has provided more capacity and she is a dream to milk. 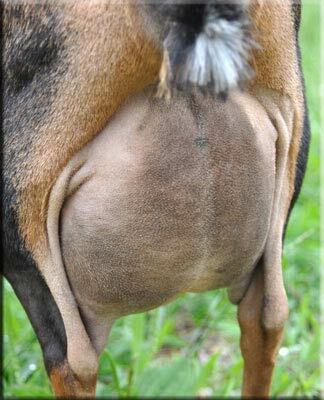 She does need more height to her rear udder and longer, more defined teats. 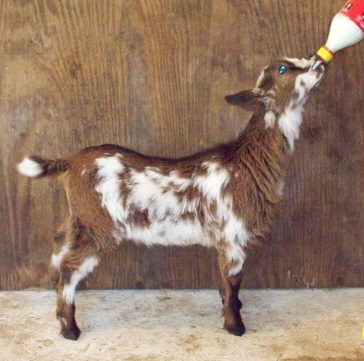 She is a spoiled and much loved goat here at Happy Tailz. Berry's age is catching up to her and so I have decided to retire her, no more babies, she will live out the rest of her life relaxing and chewing her cud and being a much spoiled doe! Please excuse this photo, she is not dippy in the chine as it looks but allot was going on at the show grounds and she was ready to take flight<G> and her front legs was not set right, ,but even still you can still see her levelness of rump, nice rear leg set and the wide openness of between her hocks. 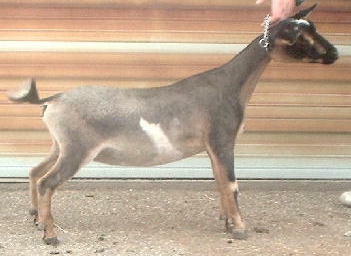 This pretty little doe is long, deep and angular. 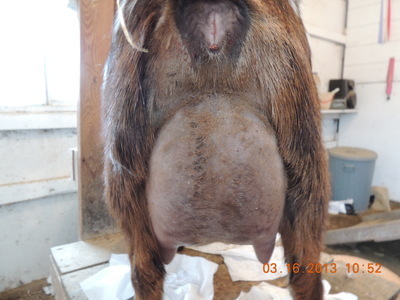 Her first freshening udder is small but is high in the rear. She could use stronger medial. She has nice teats and is a dream to milk. 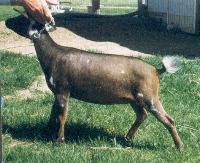 This is an old picture of this doe, she has matured with much more depth of body. I call Royal Star my tank! I just love this doe! 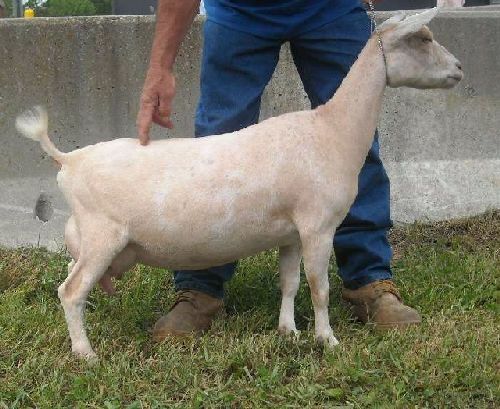 This doe has a nice soft udder, with nice plumb teats with nice open orifices, she has a smooth fore udder and nice medial, however she does lack rear udder height. 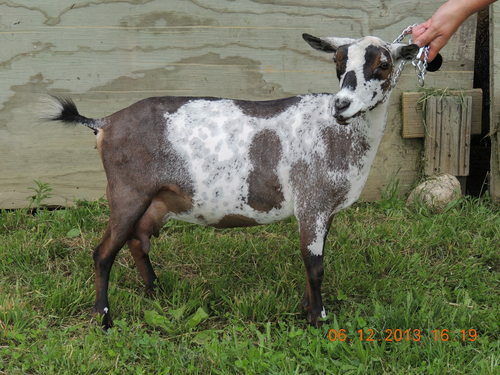 I do want to be upfront and let you know that so far I have not been able to get her to settle down on the milk stand even with hobbles, she tests them every chance she gets, so if you have more patience that I do, or milk with a milk machine or dam raise your kids, this doe is for you. She could be standing there all nice and such and you get a half bucket and she kicks it over..Im not likin that so she has to go. This is the reason why Im selling her.As a first freshener she is milking between 2 and 2 1/2 #'s a day. 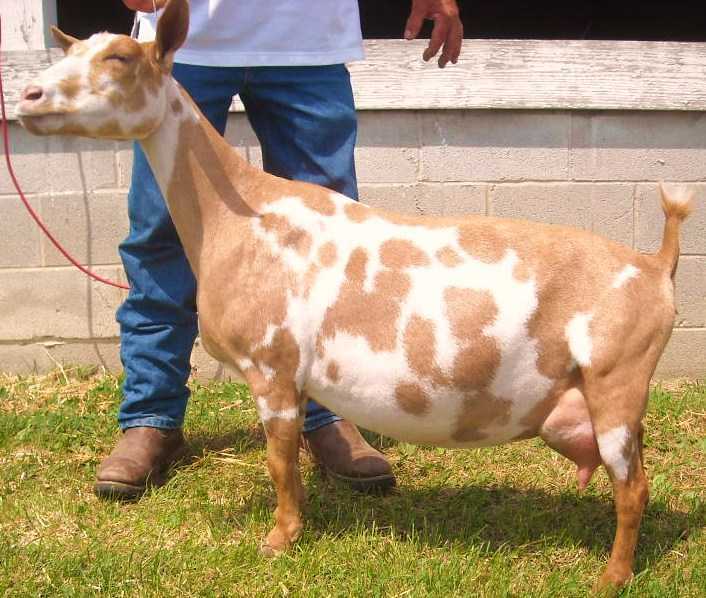 She is a very dairy doe..
yes this is the same goat<G>LOL!! This is Aggies 3rd freshening udder. 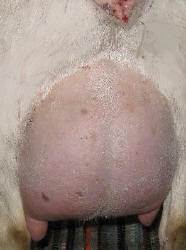 Aggie freshened with a very nice udder, however her teats are small and it does make it hard to hand milk. For that very reason I will be selling her after next year's freshening..2012. 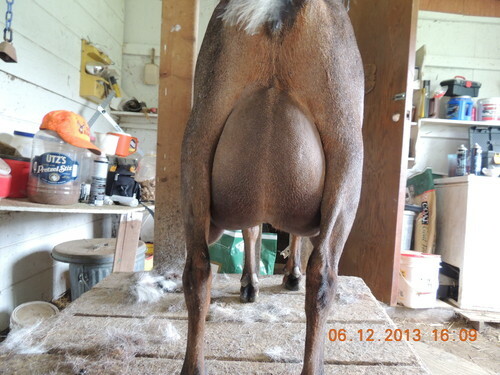 Man am I ever glad I did not sell this doe, with this freshening her teats have gotten larger, which makes milking her a breeze now and her rear udder has filled up really nicely. 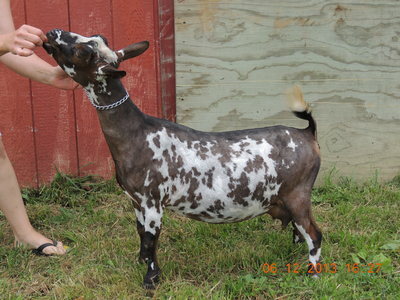 So nice in fact that I have retained her 2013 daughter, DoeRayMe. 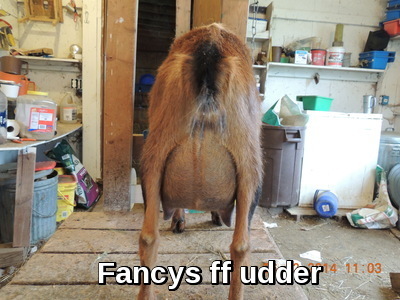 To be a perfect udder I would like to see just a tad bit more height to that rear udder and a little bit more medial, but hey you cant have everything, but I think Agggies working on it<G> This doe is a dream to milk and she is the most loving goat that I have in my herd. She will not be going anywhere any time soon. This year I put her in a one day milk test..still waiting for the results..RESULTS are in!!! She earned her milk star! 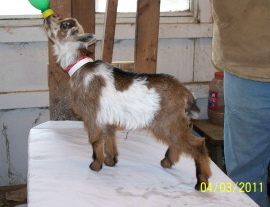 I will try and get a better picture but its so hard to do with those people friendly goats<G> The rear view is just her el natural. 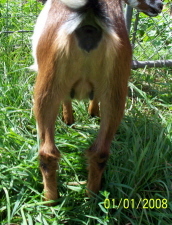 Look at those nice plum teats. Hottie freshened with a snuggly attached udder and a very smoothly blended for udder. What I would like to change would be larger teats, although her orifices are wonderful, for ease of hand milking but I'm hoping that they will get larger with her next freshening just like her 1/2 sister Aggie's did. Please excuse the hairy pictures, . I would like to see higher rear udder attachment and more lateral attachments.